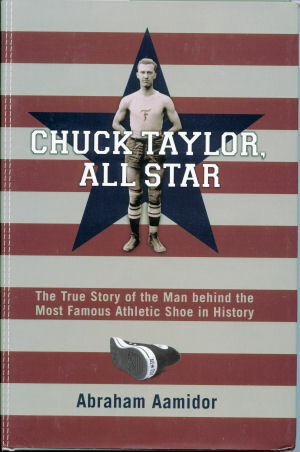 More details about the life and the influence of Chuck Taylor on the game of basketball can be found in the book "Chuck Taylor, All Star" (ISBN 0-253-34698-3), available from the Indiana University Press or your favorite bookseller. 1901 - Born in Indiana. 1908 - Marquis M. Converse started the "Converse Rubber Company." 1917 - Converse Rubber Company brought out a shoe very much like today's "All Star." 1921 - Converse hired Chuck Taylor from the Akron Firestone Non-Skids basketball team. Chuck Taylor conducted basketball clinics for Converse. 1932 - Chuck Taylor got his signature on the basketball shoe now associated with his name. World War II - Chuck coaches the Army Air Forces "Air-Tecs" basketball team at Wright Field, Ohio. 1958 - Inducted into the National Sporting Goods Hall of Fame. 1968 - Inducted into the Naismith Memorial Basketball Hall of Fame. 1969 - Passed away, probably as his namesake basketball shoe reached the height of its popularity. No, but another man named Chuck Taylor played football at Stanford in 1943, later to become football coach from 1951-1957. Chuck Taylor of Stanford football fame passed away in 2004 at the age of 74.